uPVC windows prices range from $200 to $750 for the windows and installation. 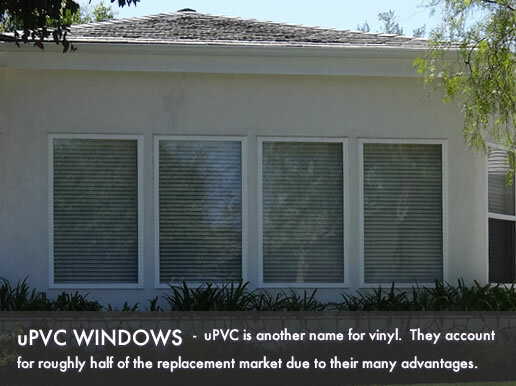 uPvc windows are simply vinyl frames and are thus identical in price. Most vinyl manufacturers now use a uPVC material in their extrusions . For project pricing, we recommend our replacement pricing calculator. Consumers will typically find a clear or basic glass used on lower end products, as well as a limited color and frame finish options. The amount of chambers and insulation will be significantly lower in these uPVC frames as compared to higher end models. Fixed frames and single hung are also the most commonly available uPVC frames. For the most part, standard uPVCs products will have a top end price of $350. With the standard grade, consumers will get a number of additional and upgraded features such as mid-range glass packages and energy efficiency (low-e glass, uv coating and argon fills). In addition, you will likely find more options for both color and style/types. These mid range products will be available in more style optins, including awnings and casements. It's possible to get a lifetime warranty from uPVC manufacturers if you decide to go with the high-end products, which is beneficial for the occasional problem. Consumers can get either double or triple paned glass with these windows as well as features like energy efficiency, fills, low U and R values and insulation. Higher end uPVCs include types like casements, garden windows, awnings and includes insulated extrusions and multi chambers. Consumers who opt for a professional installation (which is the most common) can pay around $100 to $250 just for it. The window installation cost depends on the difficulty of the work, making simple inserts cheaper than installs that require work to make the windows fit right in the opening. More extensive work typically requires carpentry, finishing and/or framing work, which is time consuming and require a certain skill set. Just like with the varying levels of windows, there are also different installers and the higher end ones will cost consumers more to hire. Find project quotes using our window cost calculator. Buget window prices for uPVC frames starts at $250 and ends around $350 per opening and including the window itself and installation. Average window prices for uPVC frames starts at $350 and ends around $500 per opening and including the window itself and installation. High end window prices for uPVC frames starts at $500 and ends around $700 per opening and including the window itself and installation.